SINGAPORE, Aug. 1, 2018 /PRNewswire/ — imToken, the world’s largest Ethereum digital asset wallet widely supporting 30,000 tokens, announces imToken 2.0, the next generation cryptocurrency wallet from imToken that supports a fully decentralized ecosystem. 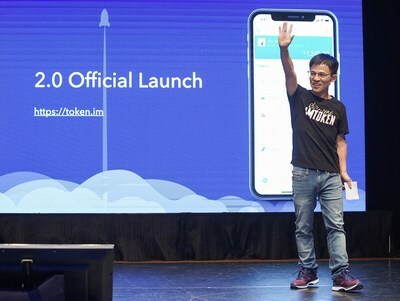 Following its $10 million Series A investment from IDG, imToken today introduces a DApp browser, Tokenlon (imToken’s decentralized exchange) and imToken Venture. The company also announces 5 million monthly active users and $45 billion in pass-through transactions between January 2017 and June 2018, rivaling Paypal’s Venmo’s yearly volume. DApp Browser – imToken’s DApp Browser supports the most popular DApps and decentralized exchanges. In addition, imToken is announcing imToken Venture, which will invest in and promote DApps and innovative infrastructure projects. Decentralized Exchange – imToken’s decentralized exchange, Tokenlon, now offers two unique trading functions. “Instant Exchange” – Selects the best exchange rates across multiple reserves for fair token-to-token conversions. Order book and spot trading – Tokenlon users can leave buy and sell limit orders or take market orders directly from the order book. Multi-Chain Wallet with BTC, ETH, EOS – Users can import and manage multiple cryptocurrency wallets, including Bitcoin, Ethereum and EOS, under one mnemonic passphrase and identity. The announcement follows imToken’s Singapore headquarters opening. To learn more about imToken, visit token.im. For the press kit visit here. Founded in 2016 by Ben He, CEO of imToken, the world’s largest Ethereum digital asset wallet, used by the leading cryptocurrency investors worldwide. Backed by IDG Capital, imToken offers support for 30,000 tokens and internationally recognized for its security features as a digital asset management tool. imToken is headquartered in Singapore. For more information about imToken, visit: token.im.